This is a condition in which the fine wrinkles. Lines and stretching of eyes occurs due to on and off appearance of upper eyelid edema. This condition is very rare and normally occurs in young childhood or early adolescence. The average age of onset of this syndrome is about 11 years. The lower lid of eye is not normally involved in this condition. Blepharochalasis appears to be inflammation of upper eyelid due to edema and leads to the formation of multiple folds over the margins of upper lid. It can be unilateral or bilateral. The edema may be painless. The attack of Blepharochalasis normally take two days and multiple attacks may lead to excessive wrinkles and discoloration of eye. It can occur in both males and females but mostly cases reported were about females. Histological findings of Blepharochalasis shows lymphocytic infiltration of dermis and there may be loss of elastic fibers in the upper eyelid. The effect of attack may persist or 3 to 4 days but it can vary from patient to patient. The attack of edema may occur average 3 to 4 times per year on the early onset of disease. Blepharochalasis do not affect the vision of eye. There may be many causes of Blepharochalasis. It may be caused due to angioneurotic edema. Puberty may be another cause of this syndrome. Hormonal imbalances can also lead to Blepharochalasis. Bee stings are also responsible for such disease. Any kind of physical activity, infection on an eye, crying a lot can also cause the syndrome. Wind exposure and exposure to pollen grains can also be the cause to Blepharochalasis in case of sensitive patients. Patient may have taken stress and this tension may lead to this disease. Any kind of injury may also be responsible for Blepharochalasis. There may be on and off appearance of swelling in upper eyelid. This may be painless swelling. Flares may also persist for 2 to 3 days. Erythema may be present sometimes. 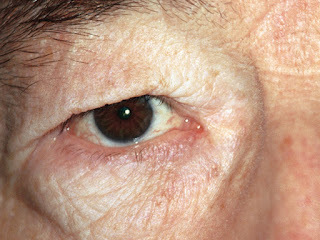 The wrinkles around eye may increase as the age may increase If the patient have multiple attacks in teenage. The skin become stretch and the patient looks older before age. Skin may also appear thin, also there may be bronze deposits. Subcutaneous telangiectasia may occur. Lax eyelid may appear which can also affect the vision. Pigmentary skin changes also occur. The prolapse of lacrimal gland is another symptom. There is not any treatment protocol established for Blepharochalasis yet. The following medications help in reduction of the disease. The above mentioned three agents are not playing an important role in the reduction of symptoms. Oral doxycycline (which is an inhibitor of matrix metalloproteinase) may be prescribed for the patients to improve edema and to prevent on and off attacks of this disease. The dose of Blepharochalasis is decreased day by day to improve the safety and efficacy of treatment. Acetazolamide is also prescribed for Blepharochalasis which prevent edema and lid discomfort in patients who refuse surgery.